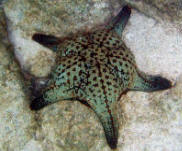 Culcita novaeguineae Mullet & Troschel 1842, the Bun Starfish, Pincushion Star. Eastern Indian Ocean, Western Pacific. To a foot in diameter. Though seemingly sessile, this animal requires large quarters with plenty of open space, and feeding of bivalves, snails, fish meat, tablets... and may eat your corals! Images made in Bunaken/Sulawesi, Indonesia and two in Hawai'i. 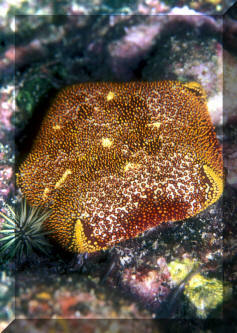 Culcita schmideliana (Retzius 1805), the Spiny Cushion Star. Indian Ocean; eastern Africa to Malaysia. To ten inches in diameter. In Malaysia and N. Sulawesi. 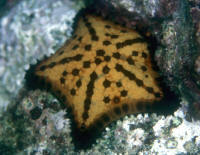 Nidoriellia armata (Gray 1840), a Chocolate Chip Sea Star. 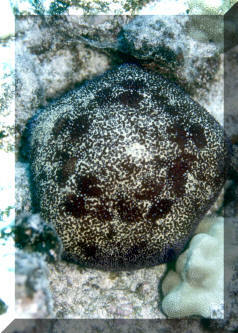 Family Oreasteridae. To 6.6 inches in diameter. Mid to Eastern Pacific; Hawaii, Sea of Cortez to Peru and Galapagos. Blunt arms, large central disc, large aboral spines dark in color. Variable color and shape. Intertidal to 73 meters, feeds on benthic marine invertebrates, gastropods and algae. Galapagos pix below. 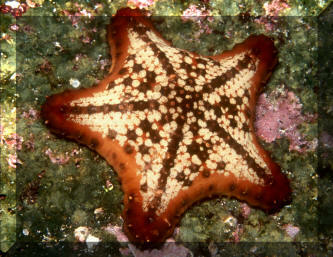 Pentaceraster cumingi (Gray 1840), the Panamic Cushion Star. Family Oreasteridae. To 13.4 inches in diameter. Mid to Eastern Pacific; Hawaii, Sea of Cortez to Peru and Galapagos. Variably red, orange to greenish blue bodied with large red spines. 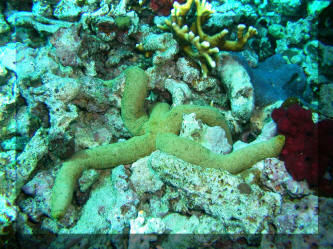 Feeds on micro-fauna in substrate, benthic algae, seagrass and other echinoderms. Usually found on sandy bottoms from shallow to 180 meters depth. Galapagos pics. 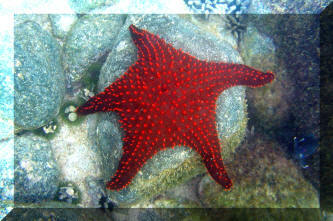 About "Linckia" Stars: There are a great many seastars sold as Linckia/Linckia spp. that are decidedly of other genera. Some are not peaceful bacterial et al. detritus feeders as the "true" Linckias of many colors (and at least two species). Do make sure and get a positive identification to species, and research the nutritional, and system size and type needs before purchasing stars. The true Linckias are good choices where available in initially healthy condition, and placed in established, large systems (at least a hundred gallons) with plenty of live rock, detritus to feed on, and not too many competitors. Named in honor of J.H. Linck who wrote a monograph of seastars in 1733. Tropical Atlantic and Pacific. 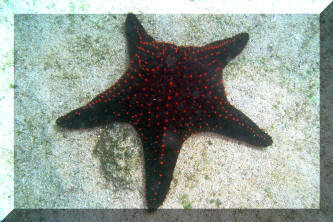 Linckia columbiae the Fragile Seastar. Semi-tropical Linckia species found in the eastern Pacific. One off of San Diego California in the process of sampling/eating a sea anemone. Linckia guildingi Gray 1840, the Green Linckia. Usually with five (sometimes 4 or 6) arms that are cylindrical in cross section. Skin appears smooth but is coarse with low, hard nodules. Though called "green" occurs in other colors (tan, beige, brown, blue, reddish). Found in Indian, Pacific, Atlantic Oceans and Caribbean. Big Island Hawaii pix.